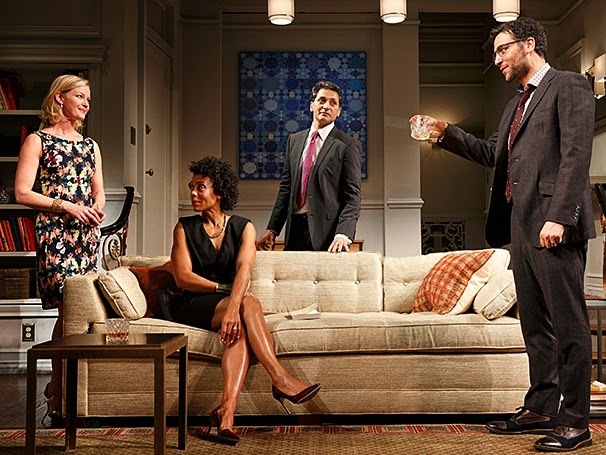 L-R: Gretchen Mol, Karen Pittman, Hari Dhillon, and Josh Radnor in DISGRACED. Disgraced, the 2013 Pulitzer Prize winning play by Ayad Akhtar, is a highly contrived, yet disturbingly compelling, work that forces one (especially one who may pride herself on her “political correctness”) to face some of the more unpleasant realities in a world that all too frequently fails to conform with how one might prefer it to be. Having opened to positive reviews in Chicago, the play subsequently enjoyed short runs off Broadway at the Claire Tow Theatre and in London’s West End; it has now moved to Broadway’s Lyceum Theatre on West 45th Street in midtown Manhattan, where I should expect it to generate considerable controversy. The play’s five person cast manages to cover a plethora of ethnic bases: two male Pakistani Muslims (Abe and Amir), one male white Jew (Isaac), one female African-American (Jory), and one female WASP (Emily). Both Abe and Amir are attempting to assimilate in America: Abe (Danny Ashok) has gone so far as to change his name to Abe Jensen from Hussein Malik. His uncle, Amir (Hari Dhillon), an American-born upwardly mobile attorney, has changed his own surname to Kapoor, thereby emphasizing his pre-partition Indian (rather than Pakistani) ancestry and deflecting attention away from his Muslim roots by suggesting that he might actually be Hindu instead. Jory (Karen Pittman) is Amir’s colleague - and they are both on partner track at the same firm. Emily (Gretchen Mol), Amir’s wife, is an artist whose paintings are heavily influenced by Islamic themes. And Isaac (Josh Radnor) is not only Jory’s husband but is also a curator at the Whitney Museum who is considering including Emily's work in an exhibition at the museum. It all makes for one helluva combustible mix. Ayad Akhtar has not written a balanced play but that is not meant as a criticism; it was obviously his intention not to do so. To be sure, he provides us with a host of politically correct liberal shibboleths right from the get-go: There’s a happily married white Jewish man and his black Christian wife and there’s a happily married Pakistani Muslim man with his blond WASP wife. Sure, the Koran can be interpreted as condoning wife-beating and worse – but it doesn’t have to be – and anyway, aren’t there pretty outrageous mandates in the Talmud as well? Yes, Ahmadiinejad is monstrous – but Netanyahu’s no saint either, is he? The bombing of the World Trade Center was horrific – no one will deny that - but does that really justify racial profiling? Beneath such superficial differences as skin color or religious conviction, aren’t we all basically the same? Unfortunately, Akhtar suggests, we may not be. As it turns out, his having paid lip service to a batch of politically correct platitudes may have been nothing more than his clever ploy to lull us into a state in which he might hit us with his much more disturbing politically incorrect message: in many respects, Islam is an inherently violent and barbaric religion that truly deserves our condemnation, rather than our convoluted attempts to equate it with other religious traditions which, for all their shortcomings, have evolved over millenia to levels well beyond that of mainstream Islam. And Muslims, having been inculcated with its values virtually from the time they were born, may very well see the world quite differently, and hold very different values, from non-Muslims. It is not that Muslims are genetically different from the rest of the human race – that would be quite an absurd contention – but the very different cultural and religious influences to which they have been subjected from birth has resulted in their acceptance of a value system quite different from that of the rest of the civilized world. That is not to say, of course, that every Muslim is evil or violent or a terrorist; indeed, many are fine, upstanding, principled, compassionate, and decent human beings, exhibiting the very best human traits. But it is to say that those who have so earned our respect have done so by overcoming, rather than succumbing to, the worst aspects of Islamic culture. In other words, many of the teachings of Islam must be surmounted, not embraced, and the humanity of many, if not, most Muslims is a function of the degree to which they have succeeded in rejecting, rather than accepting, the worst aspects of their culture. All of the action in this 90 minutes long one act play takes place in Amir’s and Emily’s Upper East Side apartment to which they have invited Isaac and Jory for dinner. But as talk turns to politics and religion, the underlying cultural differences among people that form their personalities inevitably rise to the surface: notwithstanding Emily’s love of Islamic art and culture and Amir’s superficial rejection of his Islamic roots, the Koran and its commands cannot mean to her what they still mean to him. Karen Pittman is outstanding as Jory, capturing both her drive to succeed in white America and her recognition of her own African-American history, a black woman married to a white man who persists in defining herself without relinquishing that right to anyone else, and who recognizes the tenuous balance that exists in our society between justice and order. 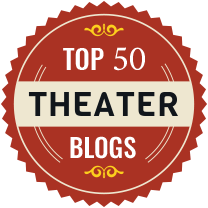 I was, however, somewhat less impressed by the other four actors, all of whom left me with the feeling that I was watching four excellent actors performing on stage but who never really succeeded in bringing me fully into their world.